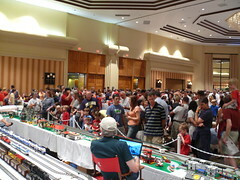 BrickFair 2008 is happening this Labor Day weekend in Tysons Corner Virginia, just outside Washington DC. BrickFair is a LEGO festival for AFOLs, open to public viewing, but only attendees are invited to play, challenge, vote and participate at every event. Check the web-site for detail on location and admission.